I've known of the existence of wild garlic for a long time. I even knew where it grew locally as I had smelt it when out running, but until my recent visit to the Celtic Food Festival at the Scottish Crannog Centre I had absolutely no idea what it looked like. Inspired by our amazing day of Iron Age Feasting and with knowledge gleaned of what to look for I returned home determined to go on a foraging trip and get me some. With my friend C and our collective kids we headed out to the woods and followed our noses. We smelt it long before we saw it. Huge expanses growing close to a burn in the shade of the woods. Boy had his swiss army knife to chop it down and we soon filled our trug. It's certainly powerful stuff and my car stank for days after our foraging adventure. 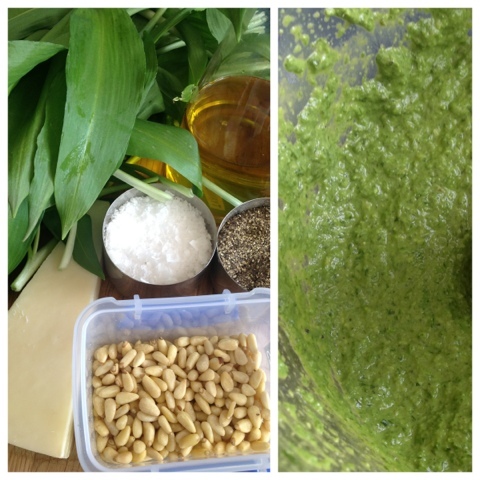 Wild Garlic Pesto was my initial aim and I blitzed some up using bucket chemistry so no exact recipe to follow I'm afraid. Wild Garlic, Parmesan, Olive Oil, Toasted Pine Nuts, Salt and Pepper. Boy was it strong. I added a couple of bunches of parsley into the mix to tone it down a bit. The resulting Pesto will still stun a Vampire at 50 yards. Not sure how long it will keep in the fridge but I've got a large jarfull in there and also filled an ice cube tray for the freezer. 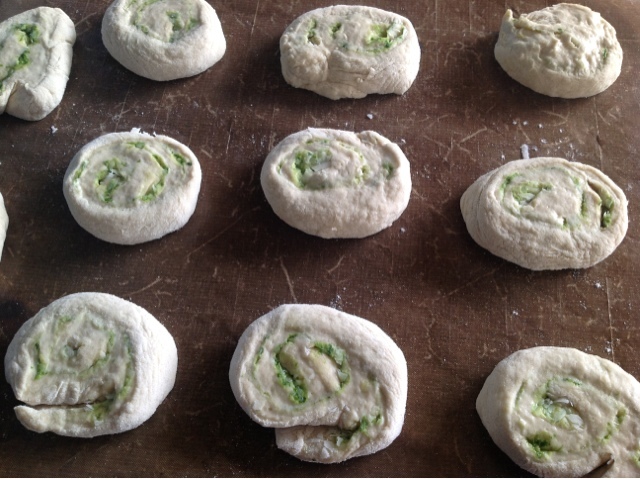 First experiment - pesto pinwheels. Sieve together the dry ingredients in one bowl and milk and lemon juice in another. Bring together by pouring the wet into a well in the dry. Mix well and add a wee bit more flour or milk if needed to make a dough. Knead lightly and roll out into a rectangle approx 1cm thick. Spread over the pesto and sprinkle with the parmesan. Roll up like a swiss roll and cut into slices. Bake at 200 degrees for 15 minutes or until golden brown. These were a huge hit and I've now made them three times. Beats shop bought garlic bread hands down. Aside from pinwheels, the pesto has been making an appearance in practically every meal over the last couple of weeks. Mixed through pasta either hot or cold. Mashed into potatoes. Flavouring the pasta and filling for ricotta ravioli and zinging up a quiche lorraine. I've thoroughly enjoyed my first foray into foraging and still have a few ideas I want to experiment with before the short lived wild garlic season is over. 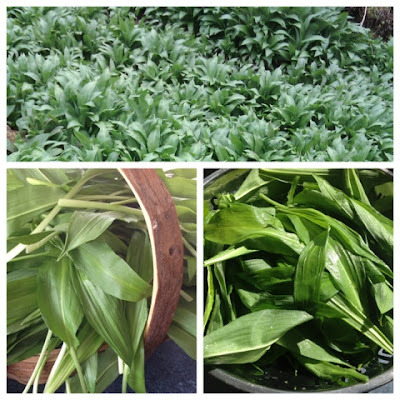 Only yesterday I found out that its also known as Ramps and that the flowers are also edible so I'm planning making New Potatoes in Ramps and Lemon for the weekend. Have also seen wild garlic combined with nettles in various dishes so I'm going to have to don some sturdy gloves and go Wombling in the nettle beds. I have been coming across it everywhere now I actually know what I'm looking for. What's the name for it in France? Ramps was a totally new one on me. Brilliant, you found some! It's lovely isn't it. Love the idea of the pin wheels, they sound very good indeed.. They are so quick and easy to make. You can literally throw them together. 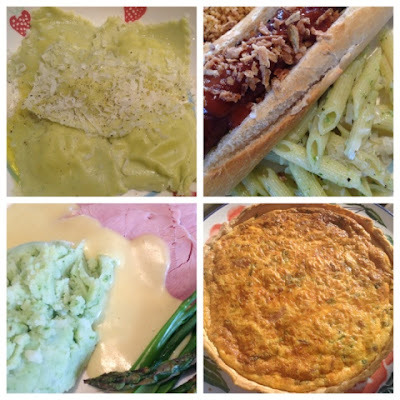 Plenty of opportunity for different filling combinations. awesome! wild food is awesome. We used to go foraging a lot when we lived in Canada (chanterelle mushrooms, wild mint, every type of berry and fruit you could imagine). Alas, I honestly don't know if there's anything edible growing outdoors in the wilds of Shetland - I'll have to look into it! I'm sure there must be things to Forage for in Shetland! I would love to forage for Mushrooms but not confident enough in my identification abilities. 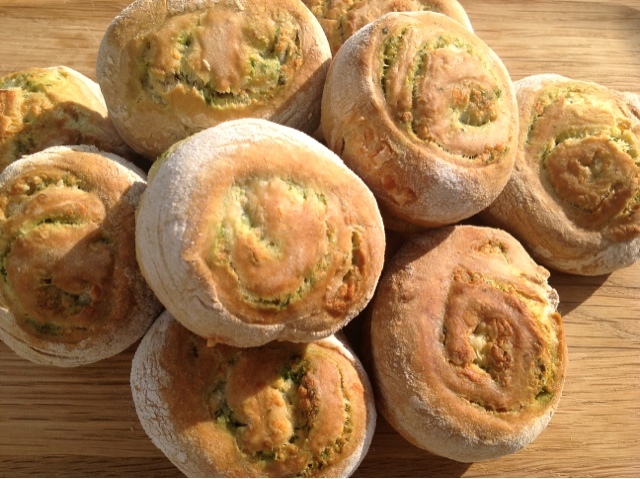 What a lovely use of wild garlic. 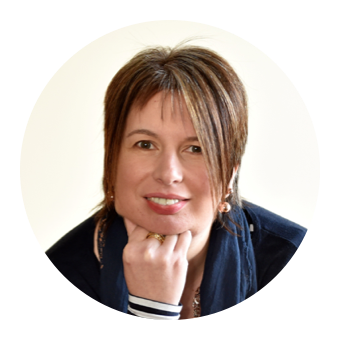 And now you've caught the bug, I recommend other really easy finds (and eventually you will find your self pulling over because you've spied something delicious in every hegerow and street). Maybe nettles, and berries later on in the year. Work your way up to comfrey, plaintain seeds, burdock root, rose petals. Nettles are definitely next on my list. I guess I foraged in my childhood but it didn't have a name then as such. Often went bramble and blaeberry picking with my granny.